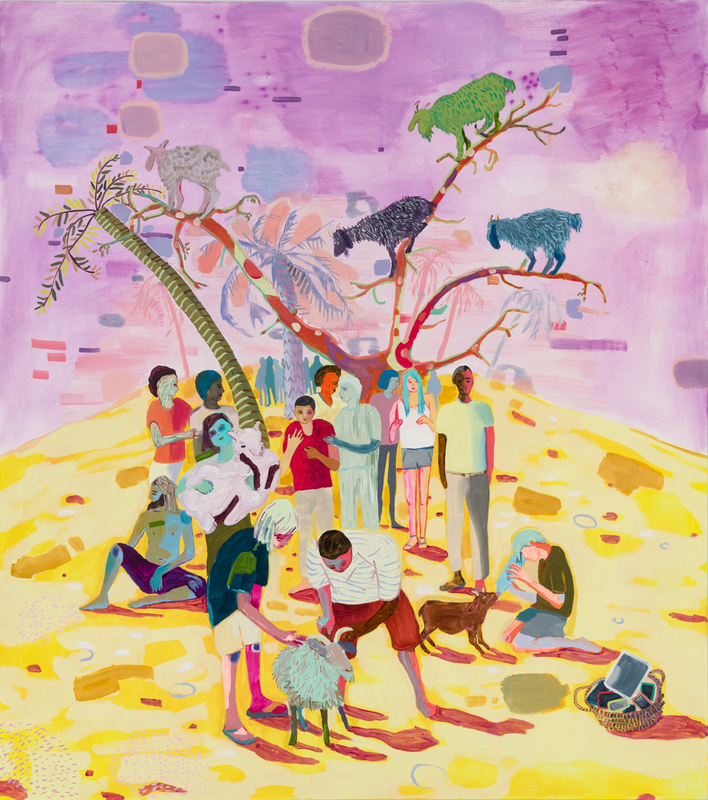 Melanie Daniel’s recent solo exhibition Late Bloomers is the artist’s fourth solo exhibition at Asya Geisberg in Chelsea. 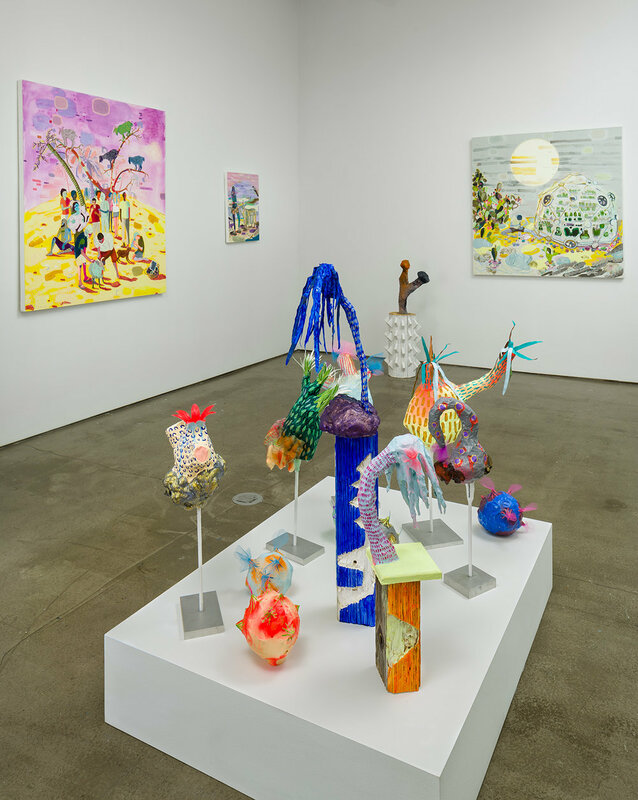 Included in the exhibition are ten paintings, eight of which inhabit the main room, encircling a grouping of bright Papier-mâché sculptures congregated on a low platform. One additional waist-high sculpture—a branching totem a la Joshua Tree—stands on the left periphery of Hothouse Artist, it’s triangular wooden scales mimicking the paintings depiction of the faceted greenhouse. The exhibition is thoroughly saturated with color—fluorescents and vivid hues layered with opaque pastels—strokes of paint handled lightly and intuitively, wet-into-wet oil paint that imbues the work with a sense of spirited playfulness. Energetic crinkle-cut clouds occupy the loosely abstracted skies, which complement the careful figurative portrayals. The compositions and colors are reminiscent of Peter Doig’s ghostly landscapes with man-made constructions, like Rainbow Wheel from 1999. The total effect is strangely dark yet effervescent—a wink and a smile in the midst of catastrophe. The images of resistance, including arson in response to the corporate greed of companies like ‘Nastle’ in Guerilla Ice, and the charming attempts at a ‘digital detox’ in Goat Love in a Digital Age portray a generation that defies contemporary cultural convention and yearns for a different path. 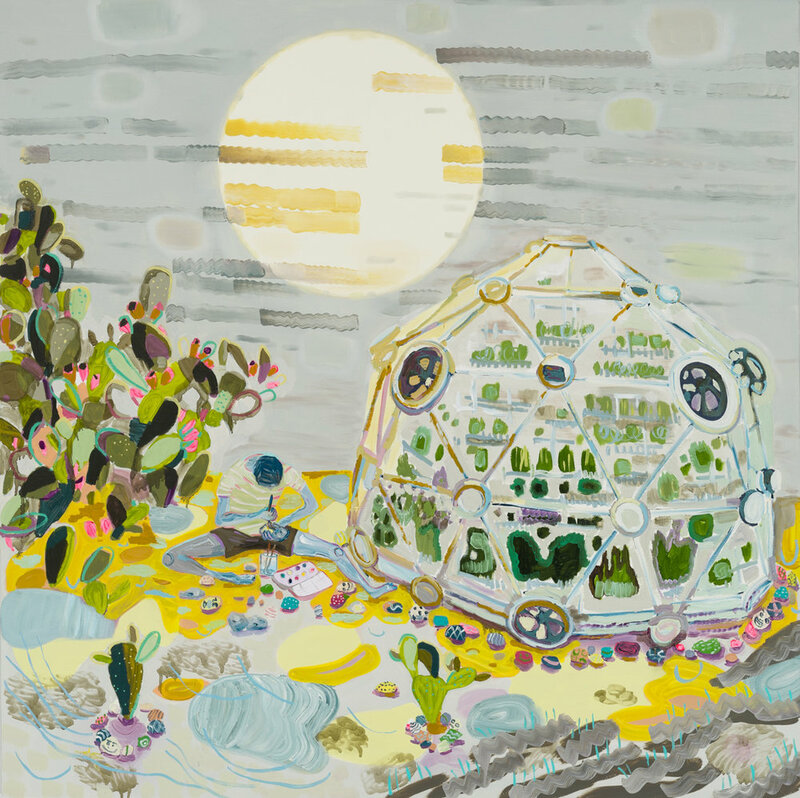 In a shift from her past depictions of forests and the deep woods, Daniels’ current scenes center around the desert—alive with bizarre yet familiar flora, resembling cacti and the inventions of Dr Seuss as seen through the psychedelic fog of a Burning Man trip. Figures feature prominently in many of these works, including Rainbow Colony, where enlightened inhabitants fixate on their requisite tasks like progressive castaways in futuristic Swiss Family Robinson-esque digs. The effect of the show is poignant and prophetic as it reflects the ironically active-helplessness of characters caught in a circumstantial time warp. Vignettes of domestic scenes are flush with creeping tension and warning signs, while paradoxically offering signs of charismatic hopefulness that the future just might hold something worth fighting for.